Electric chopper bicycles are an interesting alternative to more conventional electric bikes. 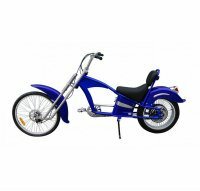 You are guaranteed to get lots of admiring glances as you ride with the cool laid back look. But, more importantly the saddle with a seatback is super comfortable. If you are looking for something different in a bicycle this just may be it. The pedal forward design not only is more efficient, if you do choose to pedal, it allows the rider to sit comfortably with both feet on the ground which most non-competitive riders like. But with the electric motor in the rear hub pedaling is very much optional. While pedaling does extend the range and is a great exercise you can choose to ride with electric power only just for the pure fun of it. Check the list of features and you will see that they have added all of the bells and whistles you need to make this bicycle a great choice.